Isabella Gunn Macdonald died 26th March 1978 aged 83. 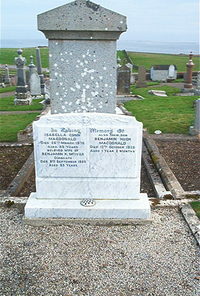 Husband Benjamin K McIvor of Dunbeath died 9th September 1985 aged 93. Son Benjamin Hugh Macdonald died 12th November 1928 in infancy.